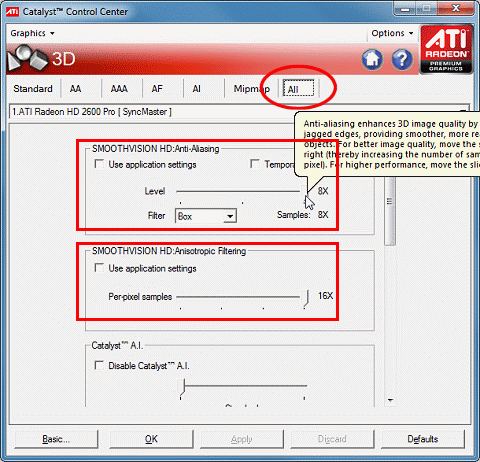 This part of the openBVE Help Guide explains how to use two display enhancement methods used on 3D graphics cards which increase the quality of the visuals you see in 3D games, namely 'Anti-aliasing' and 'Anisotropic Filtering'. This guide assumes that you are using a graphics card in either the NVIDIA GeForce or ATI Radeon product ranges, both of which include popular 3D hardware accelerators generally designed for more serious gaming performance on the PC. If you are using another type of graphics card, please consult your user guide or instruction manual for details on how to adjust it's equivalent display driver properties - not all graphics cards and drivers will enable you to alter such advanced settings however. Anti-aliasing is a technique for smoothing out the jagged edges of lines or hard edges in a 3D view, often referred to as 'jaggies', and most noticeable in lower display resolutions. Enabling anti-aliasing means that such details as overhead wires or the edges of buildings are rendered in a smooth way, without any unsightly stepping effects or jagged edges to be seen. Anisotropic filtering is a technique for reducing or removing the shimmering and 'swimming pixel' effects on textures visible in the distance, when viewed from a low angle - for example distant terrain or track textures as they get further away. Enabling anisotropic filtering significantly enhances the appearance of the graphics. If you use an NVIDIA GeForce graphics card, then you should be using the ForceWare drivers which are NVIDIA's driver set for all cards in the GeForce range. 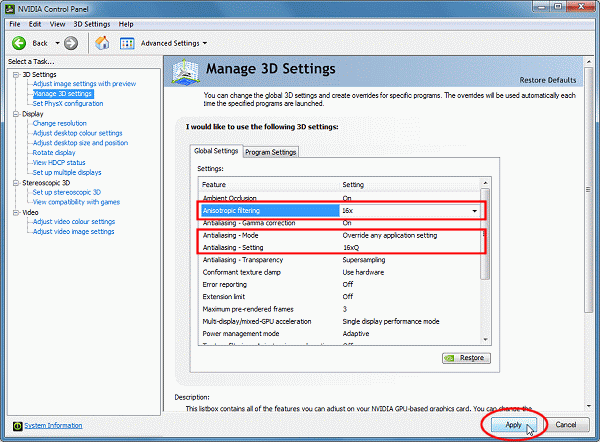 Note: One thing you should check is whether you are using NVIDIA's drivers, or the default drivers included with Windows - the default drivers do not allow you to adjust advanced graphics card properties like anti-aliasing or anisotropic filtering, and may also reduce your framerates and performance. 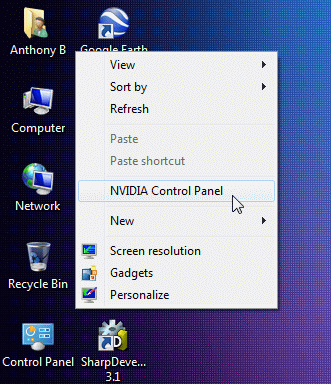 If upon following these instructions, you can't find a way to display the NVIDIA Control Panel, you should download and install the latest ForceWare drivers from the NVIDIA website if you want to use the advanced driver features explained on this page. Important: Don't install new drivers on your system unless are sure you know what you are doing. 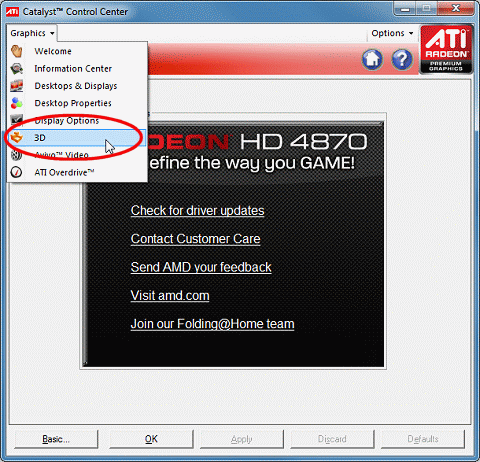 Please ensure that you can undo any changes you make to your graphics card drivers before installing new drivers - see the Windows Help and Support Centre for details about the 'System Restore' feature, which can roll back to the previously installed display driver should any problems occur. The following screenshots show the NVIDIA ForceWare 191.07 drivers. In the 'Global Settings' tab, click 'Anisotropic Filtering', and then select '16x', or whatever maximum setting is offered. Next, click 'Antialiasing - Mode', and select 'Override any application setting'. Then, click 'Antialiasing - Setting', and then select '16xQ' (or whatever highest setting is available). Now, click the 'Apply' button. 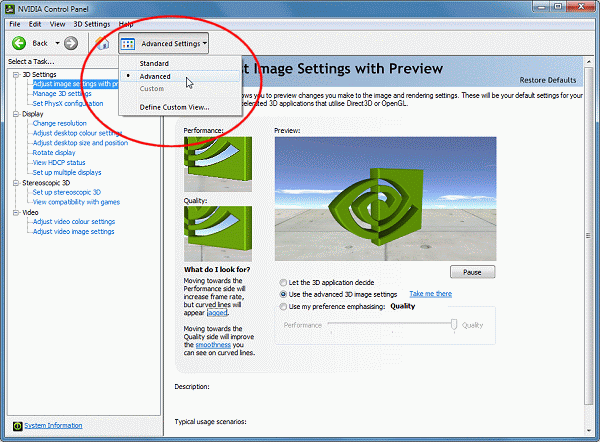 The more powerful your GeForce graphics card, the higher these settings can be without the performance penalty being too great - you may wish to experiment with the settings once you've seen how openBVE runs with the selected level of antialiasing and anisotropic filtering. 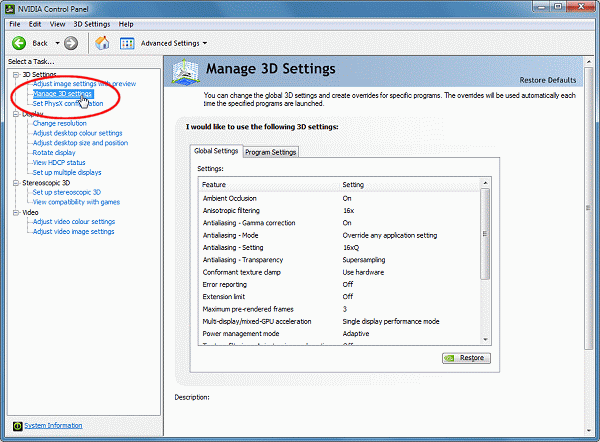 Note: One thing you should check is whether you are using ATI's drivers, or the default drivers included with Windows - the default drivers do not allow you to adjust advanced graphics card properties like anti-aliasing or anisotropic filtering, and may also reduce your framerates and performance. 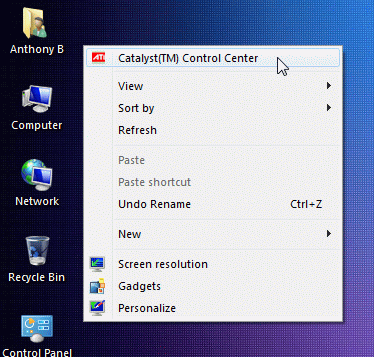 If upon following these instructions, you can't find a way to display the Catalyst Control Centre, you should download and install the latest Catalyst drivers from the AMD/ATI website if you want to use the advanced driver features explained on this page. Now, under 'SMOOTHVISION HD:Anti-Aliasing', un-tick the 'Use application settings' checkbox, and drag the 'Level' slider to one of the available multipliers (personally I use 8x anti-aliasing, the maximum). The more powerful your Radeon graphics card, the higher this setting can be without the performance penalty being too great - you may wish to experiment with the settings once you've seen how your games run with the selected level of anti-aliasing. Now, under 'SMOOTHVISION HD:Anisotropic Filtering', again un-tick the 'Use application settings' checkbox, and drag the 'Per-pixel samples:' slider to one of the available multipliers (personally, I set it to 16x anisotropic filtering, again the maximum). The more powerful your Radeon graphics card, the higher this setting can be without the performance penalty being too great - again, you may wish to experiment with the settings once you've seen how your games run with the selected level of anisotropy. The anti-aliasing and anisotropic filtering levels are now set, and you can start openBVE and see if the quality of your graphics has improved! If there is any performance degradation and you find it unacceptable, repeat the above steps and select lower levels of anti-aliasing and anisotropic filtering, and then try openBVE again. Windows users can now return to the openBVE Help Contents page or the Railsimroutes.net homepage. Ubuntu Linux users can read on for a guide to using openBVE in Ubuntu 10.10.